Explanation: Many think it is just a myth. Others think it is true but its cause isn't known. Adventurers pride themselves on having seen it. It's a green flash from the Sun. The truth is the green flash does exist and its cause is well understood. Just as the setting Sun disappears completely from view, a last glimmer appears startlingly green. The effect is typically visible only from locations with a low, distant horizon, and lasts just a few seconds. 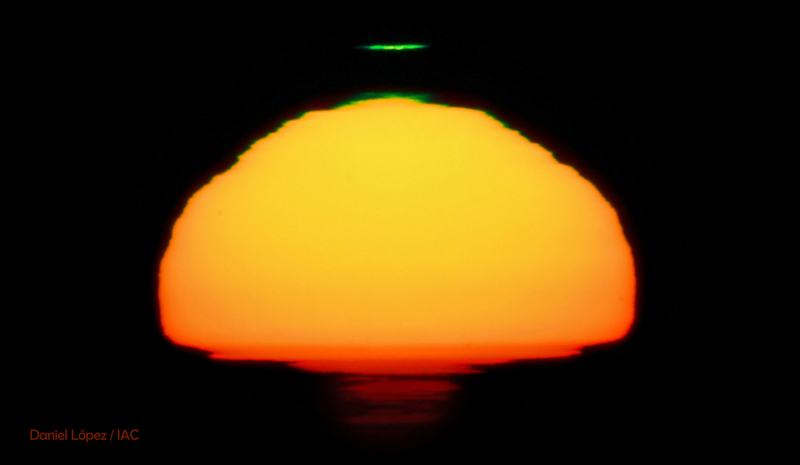 A green flash is also visible for a rising Sun, but takes better timing to spot. A dramatic green flash, as well as an even more rare red flash, was caught in the above photograph recently observed during a sunset visible from the Observatorio del Roque de Los Muchachos in the Canary Islands, Spain. The Sun itself does not turn partly green or red -- the effect is caused by layers of the Earth's atmosphere acting like a prism.